Kingdom from Raw Fury Games is a popular curiosity, in which you’re a ruler traveling the realm on horseback and trying to defend your fortress against evil enemies. For this blog post, I asked developer Thomas van den Berg about his background and the process of turning the game into what it is today. Q: What was the first game you remember playing? (Computer or otherwise) What stuck with you about that game through the years? A: I remember playing a lot of Pushover with my mom. It’s a game about an ant solving puzzles by arranging dominoes so that every single piece has fallen over when the chain reaction is over. I’m surprised there hasn’t been a remake of that game, it had really clever puzzle design (I thought). I would think out the solution to the puzzle, and then my mom had to do the “action” bit where you have to run around and put the pieces in place. That had to be done in real time —while the dominoes were falling—it was stressful and I was afraid to mess it up. In real life I played mostly with LEGO. LEGO Mindstorms was actually my first programming experience. Q: What’s the first computer game that grabbed your attention and held it? Perhaps your first video game addiction? A: I think the first game I bought for myself was Z, it is an RTS but it had an almost puzzle-like aspect to it. In order to beat the single player campaign I actually used an awesome printed ASCII walkthrough with a sequence of really precise steps for each level. The AI was pretty deterministic too, so these moves would consistently work. 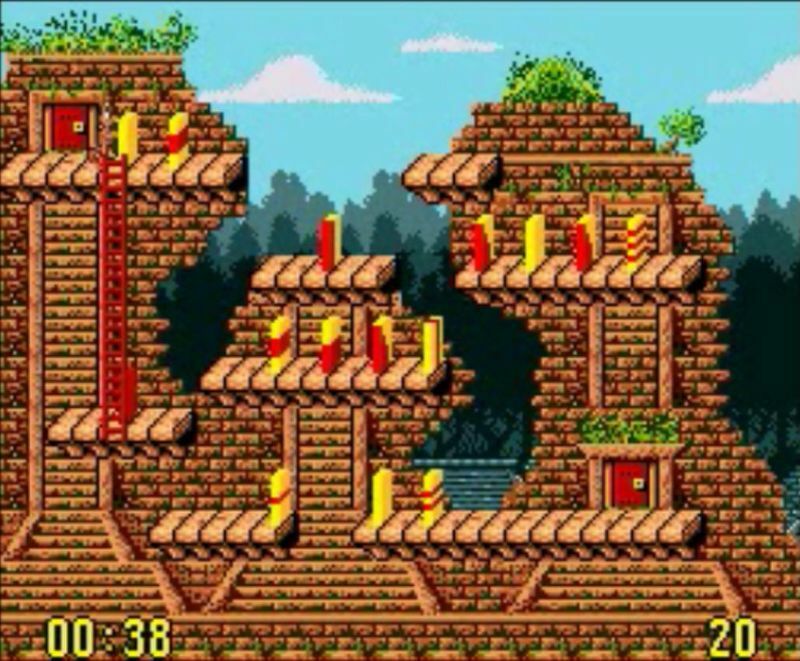 As a kid I didn’t have the patience to figure it out by myself (past the 15th level or so), but I think I would love that kind of challenge now. I was also fascinated by the graphics. Oh, and then Deus Ex, of course. Q: Describe Kingdom’s origin story. Most pieces I’ve read about it suggest that it started as a sort of animation “proof-of-concept” and evolved from there? A: That’s true! I was learning pixel art animation and I just started populating this world with the results of that practise. At the same time I was learning Flixel, and experimenting with some rendering methods. I finally found where I first encountered the method for the water reflection: on the Flixel forums. So I ended up with this simulation of little characters who would walk around and throw gold at each other. I added adversaries that spawn in waves of ever-increasing strength. The enemies simply grabbed gold coins, because I figured that would create a challenge for players to see how well they could ‘optimize’ the simulation and increase their income before perishing. 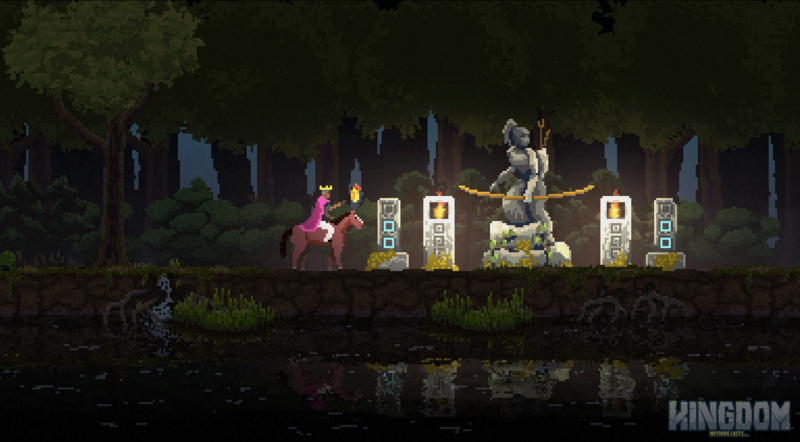 Q: How long did it take to the develop the current iteration of Kingdom? A: We (Marco Bancale and I) started working on the desktop game at the start of 2014, and released it near the end of 2015, so about two years. Q: How was your experience with Kickstarter? A: We did a Kickstarter campaign, but I think we underestimated both how much effort a campaign is, as well as how much of the game should be done by the time you start a campaign (a lot!). But, I think we did get “our money’s worth” out of the campaign. We increased our visibility, which is the main goal of a campaign anyway. If we had already had a bigger following (through other means) by the start of the campaign we could have multiplied that following by a successful campaign, but now we went from zero to something. Q: What was the greatest joy of working on Kingdom? A: I personally love working on the systems that make the simulation run and those that power the graphics. The water shader and the clouds are some of my favourite things. I also like building the little simulations (of combat, and AI) and seeing what they do when they start interacting with each other. Seeing systems interact in unforeseen and fun ways after you press “play” is the ultimate joy of programming for me. Q: What was the most significant challenge/obstacle in working on Kingdom? A: We decided to build the whole game on top of Unity’s 2D physics, which gets you a lot of things for free (raycasts, movement, little bounces that add life). This simulation-based approach can also get you in trouble when you need more precise control over what’s happening. Things like the outcome of combat can be hard to tweak if they are purely based on physics. Small adjustments to the basic parameters (speed, hitbox size) can have great effects on the whole system. Fortunately, we’ve gotten quite far using just trial-and-error tweaking of the variables. Q: When people play Kingdom, what do you hope they get from the experience? A: The best outcome is when a player views the game as a puzzle and gets the satisfaction from exploring and figuring out the mechanics. While they do this I hope they enjoy the atmosphere created by the little details and the music. Q: How did you approach the balance of visual and musical design in Kingdom? A: We basically handed over the complete audio+music design to the very talented ToyTree (Amos Roddy). Because the time progression in Kingdom is fixed, we could do something that not many games can do: we can compose complete tracks and let them play in their entirety. We didn’t have to create loopable songs and dynamic ‘combat music’. Amos wrote the tracks and decided at which time of day they should play, and which weather conditions should accompany them. This very straightforward method gave us periods of silence, with well balanced tracks to punctuate changes in visuals. Q: What do you do for fun when you’re not working on games? A: I try to somewhat minimize my screentime, so I go and exercise or spend time with friends. I also like going to concerts and movies. But I must say that the repeated crunch periods for KINGDOM have pushed aside many of my other hobbies. Q: What cultural influences (books, movies, art, etc.) had an impact on your approach to creating Kingdom? A: The landscape is inspired by the place I live. Holland is flat with a lot of water. Though then I added the rocky backgrounds for the desktop game, so that kind of broke that aspect. Aside from that, I’m a big fan of Neil Gaiman‘s writing, and to an extent, the ‘backstory’ of the Greed (the enemies) is inspired by his stories where deities are physical manifestations born out of aspects of the human psyche. Though this “lore” was totally established afterwards. The flash game had trollface.jpg monsters because I couldn’t be bothered to come up with something better. Many thanks to Thomas for taking time out of his hectic schedule to answer these questions!